Over 230,000 students are now on strike in Québec, in opposition to $103 million in cuts to bursary programs by Jean Charest's Liberal government. Other demands made by the students include an end to tuition hikes for international students and an end to "the privatization of universities and CEGEPs." According to the CBC, Liberal Education Minister Jean-Marc Fournier offered to reinstate $40 million of the cut bursary programs, but the students have argued that giving up the bursaries this year is compromise enough. Conseil du patronat du Québec. Some student organizations are organizing a march in solidarity with those affected by the Liberal government's cuts of $150 million to social assistance and the welfare reform of Bill 57. While there are varying levels of enthusiasm and radicalism among students, all those currently on strike voted on whether to join. 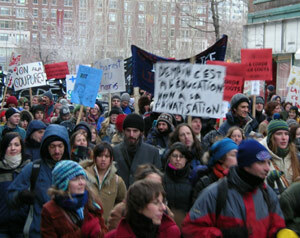 It reportedly is the largest student strike in Québec since 1974. With Charest's government low in the polls already, the striking students are convinced they can win. "If the government has the means to lower taxes by $750M, we have a hard time understanding that it does not have the means to reinvest $62M in grants," said Québec Federation of College Students President Pier-André Bouchard. » CPCML: "Jean Charest, 230,000 Students Are Saying NO!" » Polyscopique: En Grève: "interesting articles and posts about the current student strike in Québec"